"This is super special to us," Sprague said. "Elijah's not going to graduate like our other kids. He's not going to get married or have kids. So this is just a really cool experience to us for him to have this level of attention ... it's neat for people to recognize he's a really cool kid." She hopes Elijah's story can help inspire others with special needs. "The community needs to realize this is a really special population of kids," she said. "They do have special needs, but they have so much to offer." Chick-fil-A has been closed on Sundays since 1946, a practice established by the fast food chain’s Christian founder Truett Cathy to allow employees a day of rest and worship. His son, Dan Cathy, continues the practice today. 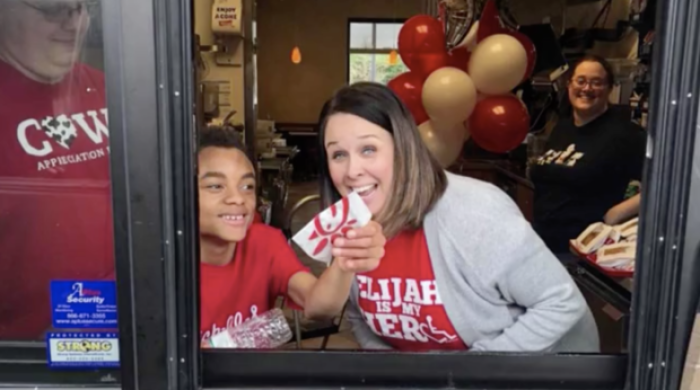 While Chick-fil-A believes employees should have Sundays off to "strengthen communities, both close to home and throughout the cities its restaurants serve,” locations sometimes make exceptions when their communities are in need, notes the restaurant website. In the wake of the Pulse nightclub shootings in Orlando in 2016, team members at Chick-fil-A Lee Vista volunteered on Sunday to feed first responders and blood donors. Additionally, on Christmas Day in 2015, after tornadoes ripped through Rowlett and Garland, Texas, team members at several restaurants spent their Sunday preparing and distributing free food to first responders and families whose homes were destroyed by tornadoes. White explained that throughout her father's life, he exemplified Jesus' words in Acts 20:35 — "It is more blessed to give than to receive" — and Proverbs 22:1: "A good name is more desirable than great riches; to be esteemed is better than silver or gold."